The pomegranate is such a vivid, vibrant and enticing fruit, that I consider it to be one of the most sensuous ingredients. It has a thick and tough pink-to-reddish skin that comes off as impenetrable. But, break into it, and you will find an overabundance of shiny, ruby red seeds that resemble jewels and have the juiciest crunch. The taste is sweet, bright and slightly tart and the bursting juice seems primed to make wine. Be mindful when you peel them, as the stains from the juice can be hard to clean off. I cut the fruit in half and then use my fingers to open up the clusters covered in a white membrane. As I remove the membrane I loosen the seeds. Some people like to do this in a bowl with water to avoid the stains. I do it without the bowl of water but use an apron for sure. 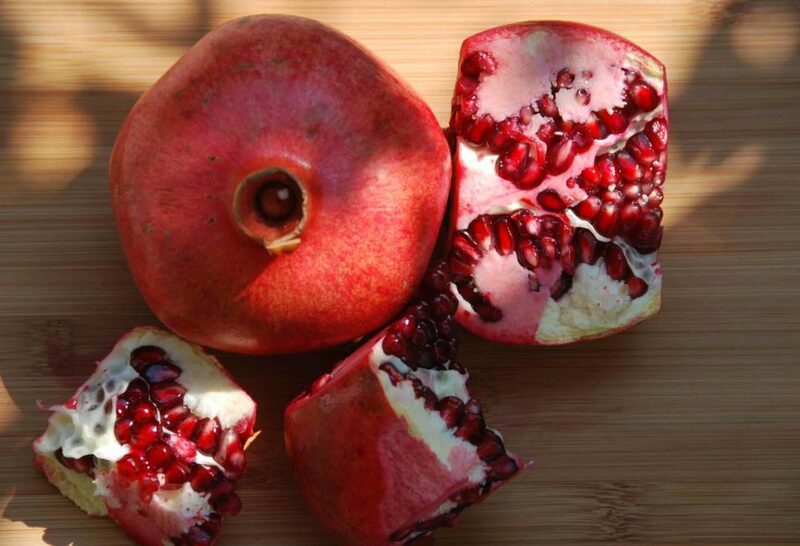 Although pomegranates are used in such a traditional Mexican dish, they are not native to Mexico. However, since their arrival to Mexico early on in the Spanish Conquest, they have grown deep roots and are grown and eaten with much enthusiasm. During pomegranate season, you will see market stands with mountains of pomegranates with the most beautiful one of the bunch opened up on top, to show customers just how red, plump and shinny the seeds are. The pomegranate is one of the world’s oldest fruits and has such a long history that it has been suggested a pomegranate, not an apple, tempted Eve in the Garden of Eden. I’m not one to know, but it originated in Persia and the Himalayas; it has been traced back as early as 3,000 B.C. And these days, it is getting to be considered a super food. Some people consider that to be because of good marketing… but it is, in fact, proven to be very nutritious with it’s generous share of Vitamin C, antioxidants, potassium, folic acid and iron. In ancient times, the pomegranate’s most noted use was extracting the juice to be used as a thirst-quencher for warriors in battle. You can still find it being juiced right next to oranges in the Middle East. So the juice is still popular for drinking, but it is also sold ready to reduce into sauces, syrups, flavoring desserts, and even making into wine. The seeds are just as widely used and are most often used raw to garnish dishes, in salads, and in desserts; if not, eaten directly out of the fruit! Many modern Mexican cooks are starting to play with it in more savory main dishes. I, like many cooks, like to sprinkle it on top of guacamole! But it would be delightful in a Pico de Gallo, right? The pomegranate may be a little intimidating to use for new comers, but it’s easy. It is not worth (if you ask me) to pay the extra bucks to buy the seeds already set free. Just put on an apron and dig in for quick gold. And if you are not in a hurry and you already brought the chubby pomegranates home, just keep them in a shaded and ventilated area of the kitchen. They last for months. 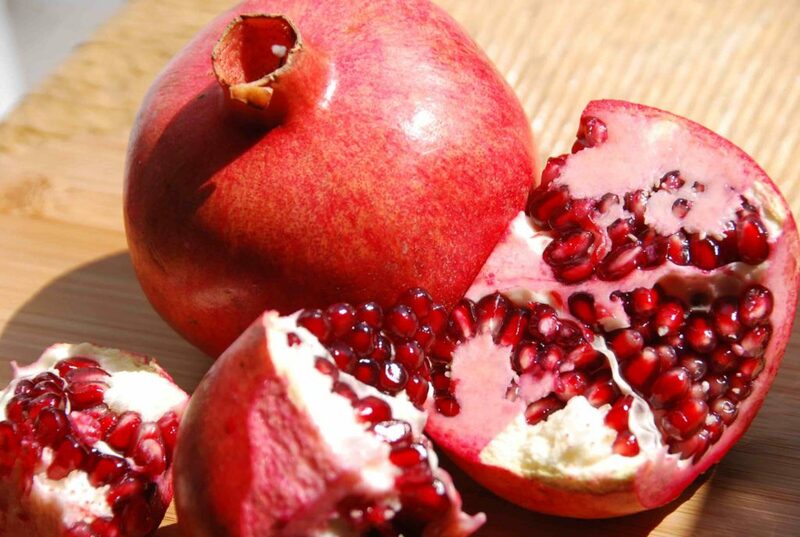 Pomegranate fruit is eaten as a sweet or sour and sweet pomegranate is a fruit that has many health benefits. Pomegranate juice contains vitamin C and also contains minerals that are beneficial to the body in high doses. Thanks for the info, Bet!